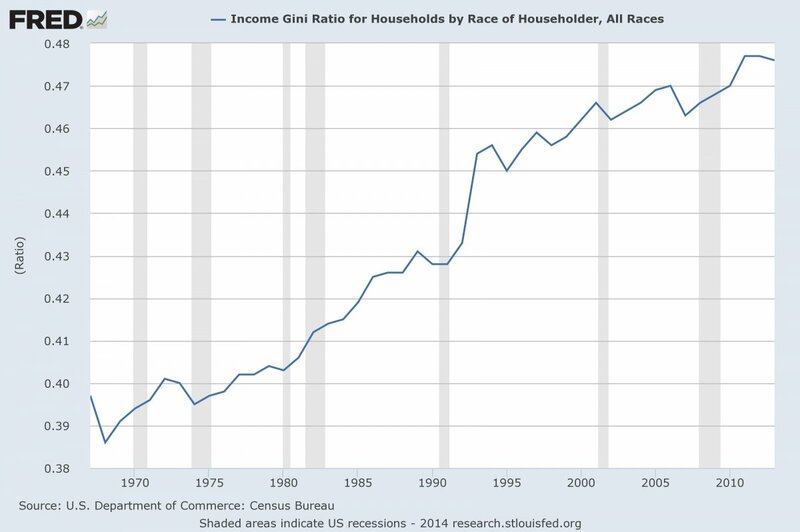 Scott Santens - Does Guaranteeing a Basic Income Reduce Income Inequality? 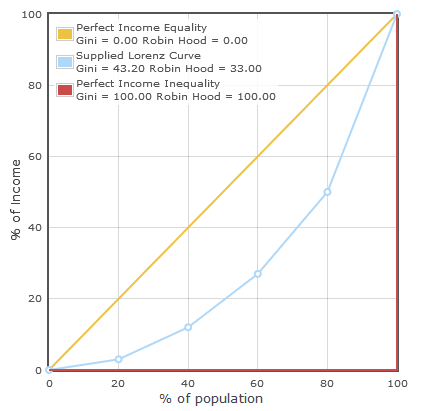 Does Guaranteeing a Basic Income Reduce Income Inequality? 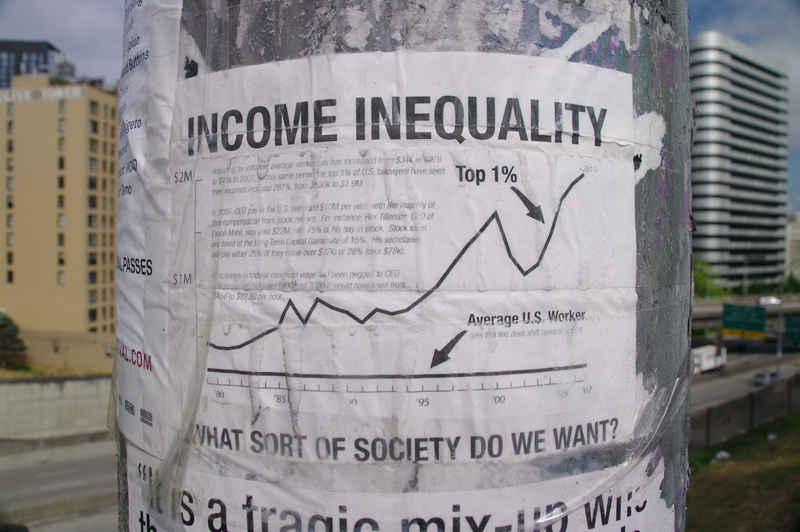 Universal Basic Income (UBI) directly reduces income inequality. I've actually written an as yet unpublished chapter for a book about this very topic, and am working on an article about this as well. That's a reduction of the Gini by 0.14. According to the CBO, our current pre-tax Gini is 0.47 and post-tax Gini is 0.43. 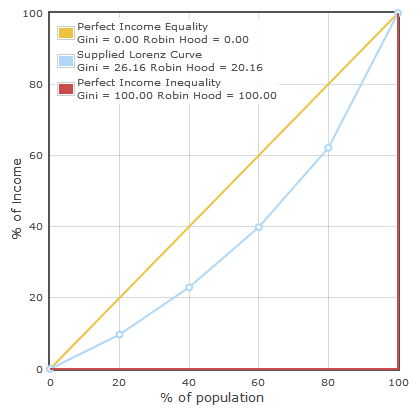 So a basic income flat tax would be an improvement of 0.10, potentially lowering our Gini to 0.33. That's enough to give us an after-tax Gini index on par with the Nordic states, and lower than even our record low in 1968. 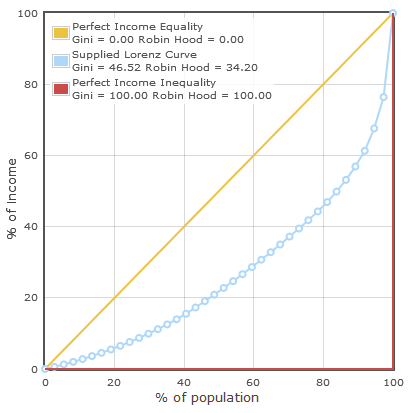 Bonus trivia: Economically optimal Gini is considered to be in the range between 0.28 and 0.38. Anything higher than 0.45 is considered a drag on the economy, and thus harmful to GDP, as well as society itself. Translation: Without taxes and transfers we'd have been screwing ourselves every year since 1995. If you're not sure how this works, imagine yourself and four friends with the following amounts of money in your wallets: $6, $18, $30, $46, $100. Now imagine you realize the two with the least don't have enough for all of you to go out and enjoy some drinks together. Your friend with $100 could just buy their drinks, but he knows people feel better about themselves buying their own drinks, and feels they are starting to resent him for always having so much more than them, and always buying their drinks. So he tries something new. Your rich friend suggests that everyone put 40% of their money into a pot, which will then be divided equally amongst all five. The result after doing so is that now the wallets contain: $19, $27, $34, $45, $76. Now your two poorest friends have enough for a few drinks, and you can all go out, but this time everyone feels independent, with no one being a charity case. Your richest friend just enabled everyone to go out and have a good time, instead of leaving two friends out or straight paying for their drinks for them. 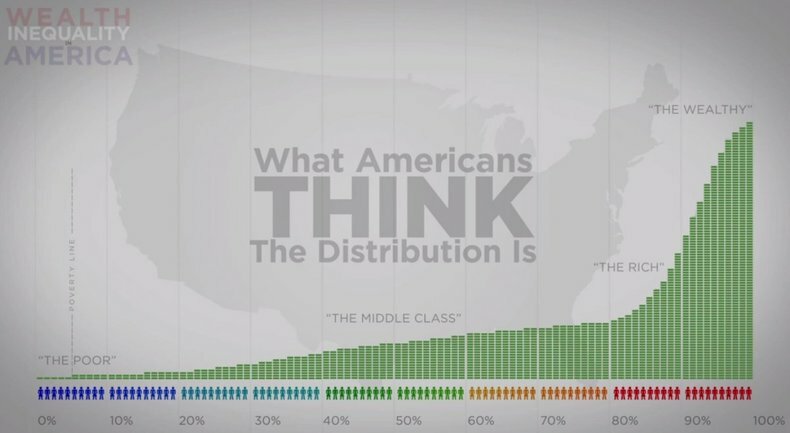 The amounts in each wallet reflect the actual income distribution by quintile in the US in 2010. 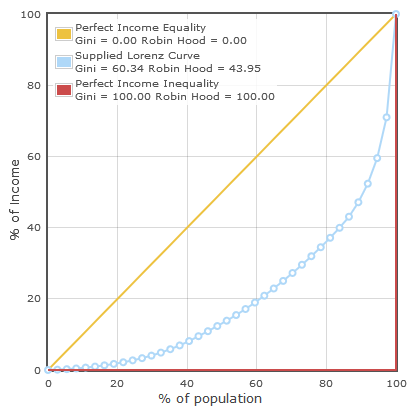 The amounts in each wallet after each throws the same percentage into a pot and splits it is the actual distribution after a 40% basic income flat tax. 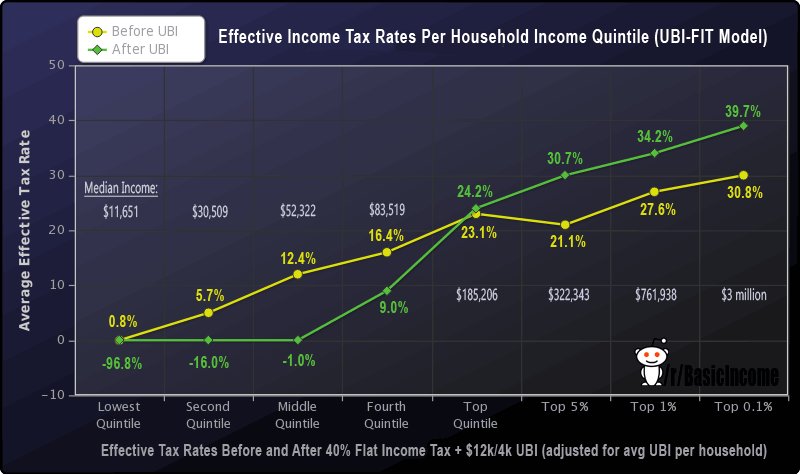 A flat tax funded basic income directly reduces income inequality by taxing those at the top more and transferring this income as extra income for those at the bottom and middle. 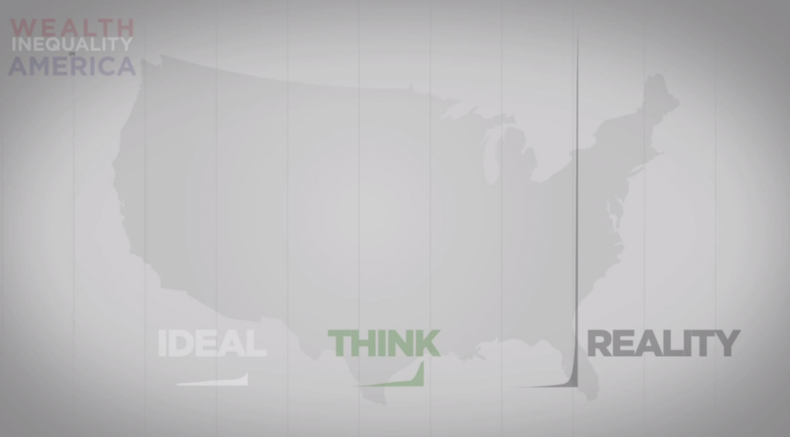 The pivot point of this modification rests at around the 60-80% point, meaning that about 60% of individuals and 80% of households would have more income after taxes than right now. Oh no, some might say. That's communism. We can't have everyone entirely equal. We can't take everything from the rich and give all their money to the poor. 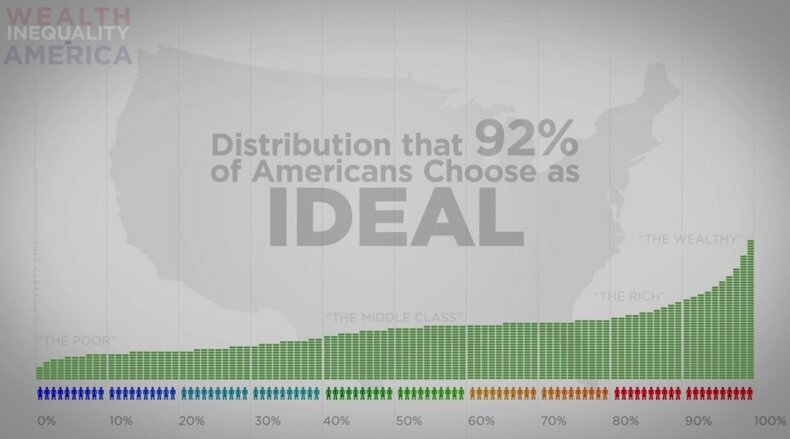 ... And would be a BIG step closer to what 92% of Americans consider our ideal wealth distribution should be. 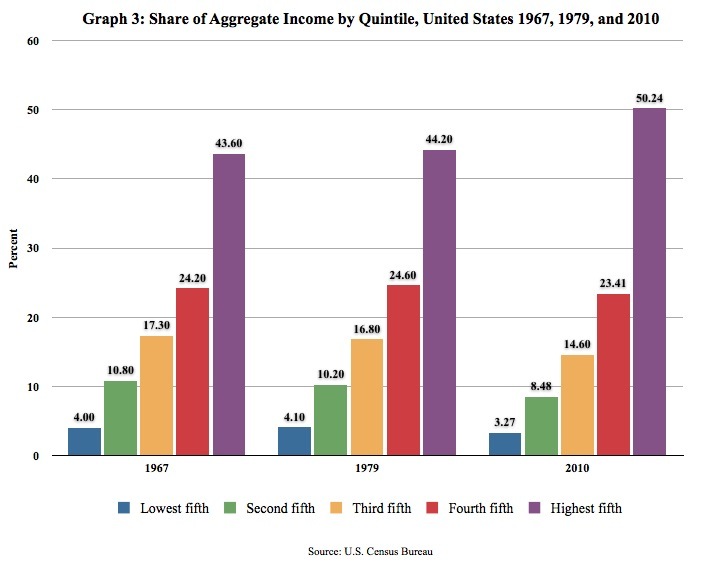 It is imperative we understand just how extreme inequality has gotten here in America. Only then will we start enacting real changes to the system - like basic income - to do something about it.